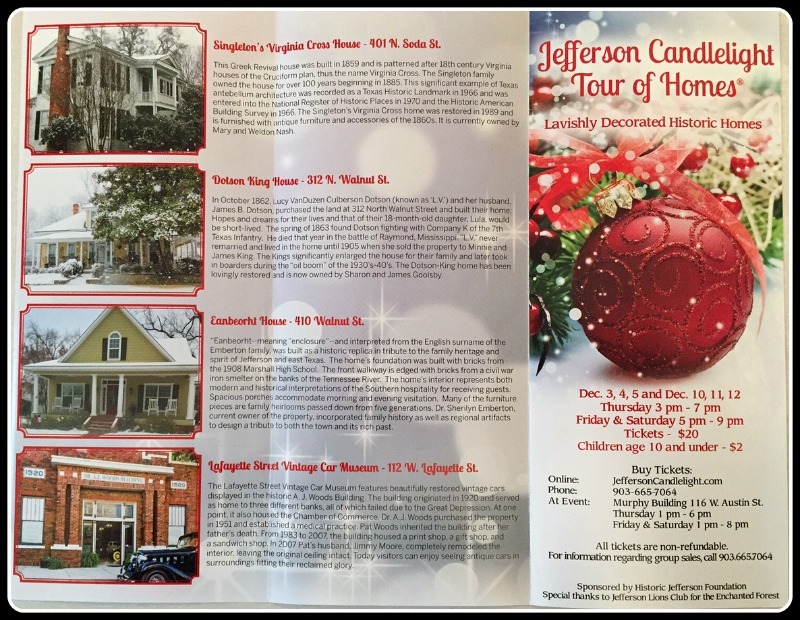 Join us for the 33rd Annual Candlelight Tour of Homes® in charming, historic Jefferson, Texas, as we share the warmth of an old-fashioned Christmas through tours of lavishly decorated homes and holiday festivities. You’ll enjoy a journey through a quiet Christmas past as you tour historic homes by the soft glow of candlelight. The fragrance of fresh fir Christmas trees and wreaths drifts through rooms as tour guides, decked out in hooped skirts and top hats, describe each home’s origins and antique furnishings. The event is held Thursday through Saturday, Dec. 3 – 5 and Dec. 10 – 12, 2015, in charming historic Jefferson, Texas. Event times: Thursday 3 pm to 7 pm; Friday and Saturday 5 pm to 9 pm.